Combination of forces, realization, action based on accurate calculation; the way of escape, success after elaborate manoeuvres. This letter means a "Prop". The Path is attributed to the zodiacal sign of Sagittarius, 'the Arrow', and is called "The Tentative Intelligence". Sagittarius is essentially a hunting sign and Diana, as the celestial Archer and the Goddess of the Chase, finds her place in this category. Apollo and Artemis as Hunters with the bow and arrow are also included. The symbol of Sagittarius is the Centaur, half-man and half-beast, who is traditionally connected with Archery; and the Horse, too, is a correspondence of Samech. The plant appropriate is the Rush, used for making arrows; perfume Lignaloes, and Green is the colour. The Rainbow is also a correspondence of Samech, and in this connection the God Ares is attributed. 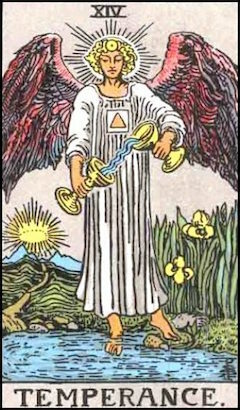 The Tarot attribution is XIV.-Temperance, showing an anzel crowned with the golden sigil of the Sun, clothed in beautiful white robes, and on his breast are written the letters of the Tetragrammaton over a white square, wherein is a gold triangle. He pours a blue liquid from a gilt chalice into another. This Path leads from Yesod to Tiphareth, the sphere of the Sun. The Angel of the Tarot, would typify the Holy Guardian Angel to whom man aspires. 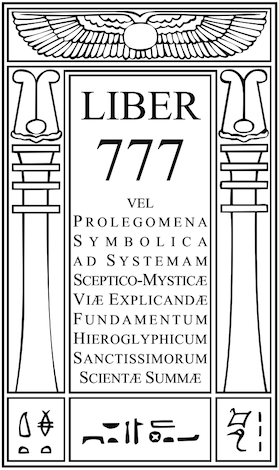 The keynote of the astrological sign, the arrow pointing heavenwards, is Aspiration, and the sigil of the Sun and the gilt triangle over the heart of the Angel, all point to the object of aspiration, representing Asar-Un-Nefer, man made perfect. Hardly any doubt can be entertained as to the correctness of these Tarot allocations. Its stone is Jacinth, which in reality refers to the beautiful boy Hyacinth who was killed accidentally by Apollo with a quoit. Angels of the Decantes (Ascendant). Angels of the Decantes (Succedent). Angels of the Decantes (Cadent). Magical Images of Col. CLV. A dog with a gryphon’s wings. Magical Images of Col. CLVII. Dragon with 3 heads—a dog’s, man’s, and gryphon’s. Magical Images of Col. CLIX. A monster [probably a dolphin]. Magical Images of Col. CLXI. Magical Images of Col. CLXIII. Magical Images of Col. CLXV. The Daughter of the Reconcilers, the Bringer-Forth of Life.